The Nineties were a bit of a manic decade for Tomas Brolin who, aged just 20 at the time, kicked things off by squeezing into Sweden’s 1990 World Cup squad despite having only made his international debut a matter of weeks beforehand. He then scored against Brazil on his World Cup debut before earning a big move to Parma after the tournament, where he duly played an integral part in the Serie A club’s mid-90s renaissance during five success-laden years in Italy. Of course, Brolin also sent England out of Euro ’92 with a silken goal that famously got Barry Davies all a-quiver, before arriving at Leeds in 1995 where he endured a fairly torrid time under George Graham before ultimately retiring from football altogether, aged just 28, in the winter of 1998. However, what lay just around the corner was perhaps the bewildering career tangent of all. 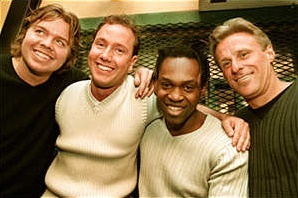 In 1999, for reasons still unexplained, Brolin formed a highly unlikely Swedish pop supergroup by the name of ‘Friends In Need’ which saw the former striker join forces with tennis legend Bjorn Borg, artist Mattias Frisk and music producer Dr Alban – best know for his 1992 Euro-rave classic ‘It’s My Life’. The fruit of the foursome’s labour was an anthemic pop single entitled ‘Alla Vi’ – which translates as ‘All Of Us’. Hasn’t aged well, has it? Upon reviewing the single at the time, Aftonbladet exclaimed “Bjorn Borg sings roughly as well as Stevie Wonder plays tennis”. In truth, both Brolin and Borg’s voices are almost entirely indiscernible, which is almost certainly a good thing. “We helped with the fringes (of the vocals) but did not do the solos,” Brolin explained at the introductory press conference. 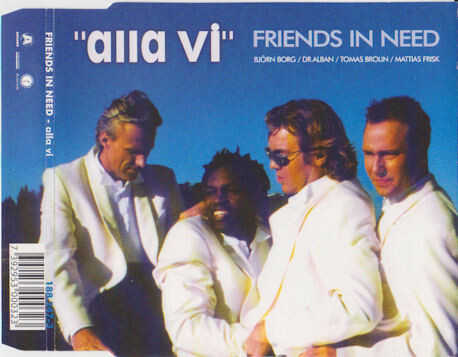 Mercifully, ‘Alla Vi’ proved to be Brolin’s one and only foray into the music business, swiftly thereafter packing it all in to focus on becoming one of Scandinavia’s top vacuum salesmen. No, seriously – you can read all about it in FourFourTwo’s rather excellent ‘Big Interview’ with the ex-Leeds man, and we thoroughly recommend that you do just that! Cheers John. Glad you like it. We’ll hopefully be getting round to much more as the season progresses.